Improve hardware, software and intercept capabilities of the Airborne Laser (ABL) System Integration Laboratory (SIL), a ground-based test platform, and of the first Boeing 747-400 airframe and laser system. Test ABL against a full range of threats and improve integration with other BMDS segments. Continue work on development of the Kinetic Energy Interceptor (KEI). Complete prototype hardware and software maturation of Ground-based Midcourse Defense (GMD) interceptor, sensor, and C2BMC components. Demonstrate added GMD weapon and discrimination performance and interface with external sensors. Demonstrate enhanced warhead seeker discrimination, remote engagements of targets using tactical data links, and surveillance against long-range strategic class targets in Aegis Ballistic Missile Defense (BMD) flight missions. Enhance capabilities of the SM-3 interceptor missile in cooperation with the Japan Defense Agency. Begin theater high-altitude area defense flight tests. Improve interceptor endgame discrimination capability against increasingly complex targets. Launch two low-earth orbit satellites, equipped with infrared and visible sensors. Validate space-based sensor concepts for target acquisition, tracking and discrimination and provide a space node for the BMDS Test Bed to support data fusion, over-the-horizon radar and sensor cueing, and interceptor handover and fire control. That North Korea and Iran both present potential military threats against the United States and U.S. interests has become evident from recent news headlines. These perils are represented not only by the potential or actual development of nuclear weapons by these countries but also with the deployment of ballistic missile systems to deliver those weapons. Countering these emerging threats is the business of the Missile Defense Agency. The MDA has developed a multifaceted strategy to accomplish its mission. The weaponry it is developing emphasizes hit-to-kill technology. Layered defenses address the interception of enemy missiles at different segments in their trajectory. Spiral development in two-year blocks allows the agency to refine program objectives as technology becomes available. Hit-to-kill weapons, instead of carrying an explosive warhead, rely on kinetic energy to collide with and destroy its target. The force of the collision, in other words, rather than explosive force, pulverizes the target warhead. The MDA is also developing an airborne laser, which uses directed energy to destroy a target. MDA’s layered defense strategy addresses the three aspects of ballistic missile flight: the boost, midcourse and terminal phases. This strategy endeavors to develop capabilities to attack missiles in all stages of flight, thus maximizing the advantages of the missile defense system over an aggressor’s weapon. Spiral development supports an evolutionary acquisition approach which promotes improving the effectiveness of defensive capabilities over time. This block development scheme allows planning for incremental improvements in capabilities and focusing on integration activities. sea-, air- and space-based sensors, and a battle management command and control system, in order “to engage all classes and ranges of ballistic missile threats,” according to an MDA document. All five of the major defense contractors—Lockheed Martin, Raytheon, Northrop Grumman, Boeing and General Dynamics—are participating in developing the BMDS, with none of them serving as prime contractor, according to Air Force Brigadier General Robert Dehnert, MDA’s deputy director for Command, Control, Battle Management and Communications (C2BMC). By consent of all the companies, Lockheed serves as the team leader. Thus, a top focus of Block 2004, which encompassed acquisitions during the 2004 and 2005 calendar years, was in creating an initial capability for a ground-based midcourse system, specifically designed to counter a North Korean threat, according to Dehnert. In Block 2006, which covers calendar years 2006 and 2007, that capability will be expanded to a sea-based system. “A variant of the ground-based systems deployed at Vandenberg Air Force Base in California and at Fort Greely in Alaska will be deployed to Aegis ships by the Navy,” said Dehnert. Six Aegis ships, three cruisers and three destroyers, will be equipped with the Long Range Surveillance and Tracking (LRS&T) capability, as well as the engagement capability, which involves the ability to launch the SM-3 intercepting missiles, by the end of this year. In addition, 10 Aegis destroyers will be equipped with LRS&T. By the end of 2008, 18 Aegis ships, 15 destroyers and three cruisers, will be fully equipped with both LRS&T and SM-3 interceptor capabilities. Dehnert uses a football analogy to explain the difference between current battle management systems and the one he is building. “In a football game, offensive and defensive coaches on the sidelines might be able to show pictures to their players of earlier plays, in order to show them what happened and what to do differently,” he said. “My system will be like providing real-time information directly to players through their helmets. That way, players can adjust immediately to a particular play. It took 21 months from the birth of the idea of the need for a system for missile defense situational awareness to the fielding of what Dehnert described as a “rudimentary but effective” system. One screen view, he said, gives the user a panoramic situational picture that spans 17 time zones. The system has been installed in the White House, the Pentagon command center, the U.S. Strategic Command, as well as the Northern Command. “Without that foundation we would be unable to defend against a North Korean threat,” he contended. Dehnert chairs the NATO missile defense committee, a true cat-bird seat from which he can observe international missile defense efforts and through which he is in a position to dialog with the Japanese, Australians, British, Italians and others who are working on missile defense. 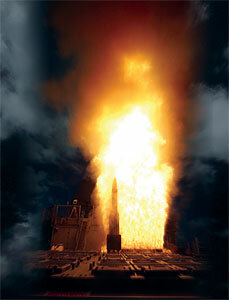 MDA is working on enhancements to the SM-3 interceptor missile with the Japan Defense Agency. As for the future, Dehnert sees continually “adding new systems and constantly increasing and improving data sharing between assets.” Among the projects in the works include those that cue radar systems to point in the direction of perceived threats and others that more efficiently pass data on to shooters.